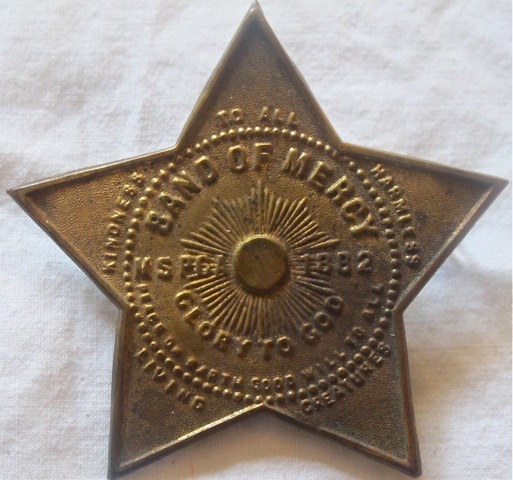 The Band of Mercy Badge used in the United States was star-shaped and was sometimes nicknamed “The Star of Bethlehem.” The badge is comprised of different phrases and symbols situated in a circular pattern set within the shape of the star. Band of Mercy Badge, late 19th century. Collection of Scotlund Haisley. In this example the words “Kindness To All Harmless Living Creatures” forms the outermost circle. Another version of this badge contains the phrase “Kindness Justice Mercy To All” in the same position. In the very centre of the badge is a representation of the sun, “shining in mid-day splendor.” The sun was placed in to the design of the Band of Mercy badge to symbolize “the Sun of Righteousness pouring his beams of kindness and healing on all the world.” The phrase “MSPCA 1882” is also centrally placed in the Band of Mercy badge design to indicate the origins of the movement in the United States.